Founding Feminists is FMF’s daily herstory column. Making bold predictions of a record-breaking number of marchers for a suffrage parade is always a very risky move. A moderate-sized procession could be described in the newspapers as a “disappointing turnout,” and in this case, coming just ten days before a vote, dim the chances for passage of the upcoming New York State suffrage referendum. But much to the relief of organizers – and all who favor equal suffrage – the optimistic forecasts were at the very least fulfilled today, and in the opinion of some, exceeded. New York City saw a spectacle that will long be remembered by both participants and spectators, and which clearly must have made a highly favorable impression on undecided voters, and even on some of the movement’s skeptics. Yesterday, organizers had announced that 47,230 people had pledged to march. But according to Police Inspector Myers, in charge of the traffic squads, there were 50,000 in the streets today, though the New York Times and other anti-suffragists naturally had lower estimates. Chief Inspector Max Schmittberger estimated at least 35,000 marchers, and said the crowd numbered 250,000. Other estimates went as high as 60,000 marchers. But there won’t be much time wasted quibbling over numbers, because absolutely no one doubts this was by far the largest suffrage parade in the nation’s history, and that it was a truly stunning procession. Both the marchers and spectators began gathering at Washington Square in early afternoon, with each of the participants searching out the group they’d pledged to march with, while bystanders began buying huge amounts of suffrage pennants, balloons, buttons, and anything in “suffrage yellow,” or which had the name of a suffrage organization on it. By the time the parade was to start, the 1,500 police officers assigned to crowd control were fully occupied keeping the spectators on the sidewalks, and the street clear. The parade kicked off right on time at 3:00, with the first group of marchers passing the Fifth Avenue and 41st Street reviewing stand in front of the Public Library at 3:40. The last of the marchers did not finish passing by the dignitaries until 7:10 this evening, their numbers leaving no doubt that the loss in the New Jersey suffrage referendum vote of four days ago has only spurred suffragists on to greater efforts, rather than discouraged anyone from making an all-out push to win in New York, as well as Pennsylvania and Massachusetts on November 2nd. Though many of the most memorable sights were of huge, complex, horse or automobile-drawn floats, it was the well-known and highly respected Rev. Anna Howard Shaw, marching behind the National American Woman Suffrage Association banner in her cap and gown that brought the first big round of applause. The plucky New Jersey delegation, holding a banner that said: “NEW JERSEY: DELAYED BUT NOT DEFEATED” got even more applause. This expression of support was something they must have appreciated after having just suffered a major delay in attaining suffrage since they cannot re-submit their failed suffrage referendum again until five years have passed. The suffragists of Rutherford had their own banner, taking pride in the fact that the men of their city had voted nearly two-to-one in favor of equal suffrage for women. As might be expected, the Manhattan delegation was huge and well-received by the crowd. It featured a blindfolded woman representing “Justice,” bound by a rope held by three masked men dressed in black, labeled “Vice,” “Ignorance,” and “Prejudice.” But it was an elderly woman in the delegation, carrying a placard that said: “GETTING THERE AFTER TRYING FOR FORTY YEARS” who may have gotten the biggest cheer of the day. Young Brooklyn suffragists carried parasols inscribed: “THE SUN WILL SHINE FOR US NOVEMBER 2ND,” while some Bay Ridge activists wore white and blue costumes as they walked alongside a wagon containing two small children. The motto on the side was: “WE WANT OUR MOTHERS TO VOTE.” But it was the Woman Suffrage Party that earned the prize for putting the most children on a float, plus having Rose O’Neill herself decorate it with her famous “Kewpie” cartoons. Even a large “Kewpie” doll was swinging back and forth on the front as the float drove down the street. There were floats illustrating everything from woman suffrage around the world to those showing women representing “Victory,” “Liberty,” “Equality,” and “Justice.” Some marchers were over 70 years old, while others as young as 7 months were pushed in carriages or carried on a marcher’s back. At least 2,500 men marched with the women, highly skilled equestrians impressed the crowd, and so many bands played that at no time or place along the route was there ever a lack of music in the chilly Autumn air. Every imaginable occupational group was represented, generally with members in some costume denoting their profession, as well as a banner in front stating what their work was, in case there was any doubt. Each suffrage group, from the largest to the smallest, had its own delegation and unique colors, though white and “suffrage yellow” were the most common colors used today. This was truly a great day to be a suffragist – or in some cases, to become one. 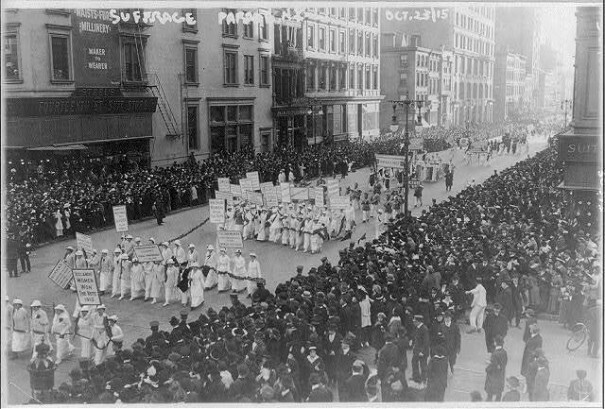 If the victory sought today is achieved on November 2nd, it means this perfect parade will never have to be equaled or topped at any time in the future, and will be the way the final days of the suffrage campaign in New York will be fondly remembered.